I still remember the confusion I felt when faced with my smart, sweet eight year-old son in tears over a really simple task. “What’s wrong with you?” I wanted to demand. “I know you can do this! Just do it!” Thankfully, I restrained myself because, as time went on, it became increasingly clear that I had a child who was afflicted with anxiety. For him, it started with common phobias like fear of dogs and elevators. However, when he gets stressed, it can start to invade every aspect of life. He also has perfectionism, which is closely tied to anxiety, and can stop him from getting work done because he fears it won’t ever be good enough. Psychologists say that somewhere between a quarter and a third of young people suffer from anxiety and most of them agree that anxiety is on the rise among children and teens. There’s no one cause of anxiety. In our case, I know that genetics have played a prominent role since many of my son’s fears mirror his father’s. However, most experts think that many aspects of our modern lives are partially to blame for this rise, including the kids’ over-scheduled, hectic environment, the increasing push of social media, and the emphasis on testing and early academics in schools. From where I sit, the best way to step back from those influences and give an anxious child enough room to grow and develop is to homeschool. Homeschooling isn’t a magic solution to anxiety. There are no magic pills for anxiety and things that work for most kids don’t always work for everyone. 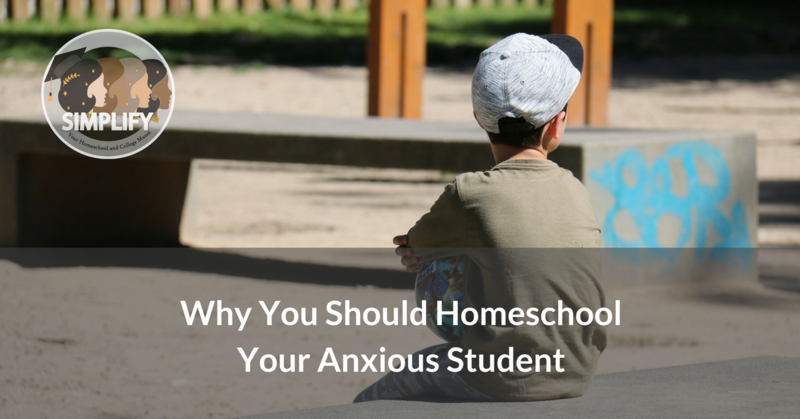 However, homeschooling is a good way to create a safe space for a child with anxiety. When you homeschool, you can de-emphasize stressful testing experiences and academic competition. Students can work at their own pace and level. You can set your own schedule. Students who struggle with sleep issues, a common side effect of anxiety, can be given more time to get enough rest. When anxiety flares up, you can step back from what you’re doing and address it instead of having a child be left behind from the group or forced to push ahead despite a crisis. You can even work therapy techniques into your child’s daily homeschool schedule. For older students, learning about topics like psychology and neuroscience as part of the school day can help them understand and manage their anxiety bettter. With homeschooling, you can keep your child’s social environment more positive than in some schools. And from a practical perspective, homeschooling means you’re more likely to get your pick of the best therapists since your schedule is more accommodating. It’s a balancing act, of course. It’s sometimes easy to not demand enough from students with anxiety, so it’s important to figure out how and when to push an anxious student as well. For example, if you have a student with social anxiety, homeschooling makes it easy to avoid getting overwhelmed by constant socializing. On the other hand, it doesn’t benefit a student’s anxiety to never socialize. One of my son’s anxiety triggers is testing. For a long time, we did almost no testing, but as he’s gotten older, I realized I need to introduce testing for him to practice managing his fear. Homeschooling lets me do that for him in a gentler, more productive way, but I have to remember to do it, even though it’s not always fun for any of us. No matter where an anxious child learns, their journey can be rocky. Overall, I think the best way to help smooth the path and equip them to be strong and resilient is to homeschool. For my anxious student, it’s been a real life saver. While his anxiety sometimes flares up, we have routines and tools to help him control it. As a result, he’s a mostly happy kid who isn’t overwhelmed by his fears.